Few medical disorders have been used as a defense in murder trials; rapid eye movement (REM) sleep behavior disorder (RBD) has. A fascinating parasomnia of REM sleep, RBD relieves patients of the muscle paralysis (atonia) that is a cardinal feature of REM sleep in adults. Motor activity and behavior reflecting dream enactment ensues, often in a violent manner that can lead to injuries.1,2 A 1996 article in The New York Times titled “When Can Killers Claim Sleep Walking as a Legal Defense?” exposed the extremes of RBD. Although the article may have been a bit alarmist, and the RBD defense has not become common as feared, RBD has gained notoriety as a herald of neurodegenerative disorders, which is far more ominous. In addition to injury to self or sleep partners and disrupt-ed sleep, it is of great clinical significance that RBD is a strong predictor for synucleinopathies (eg, multiple system atrophy, dementia with Lewy bodies, and Parkinson’s disease [PD]).2-6 People with RBD may dream they are being chased by other people or animals and react by shouting, screaming, crying, kicking, choking, or even jumping out of bed.5,6 Diagnosis is made with polysomnography that shows lack of atonia with related motor behaviors during REM sleep.1 Patients with idiopathic RBD (iRBD) are likely to have history of head injury or pesticide exposure (similar to PD) and depression. In these patients, however, depression may be an early sign of a neurodegenerative disorder. Low level of education, smoking, and ischemic heart disease are also associated with iRBD. A family history of dream-enacting behavior is common in patients with iRBD, even without family history of dementia or PD. As research focuses on identifying prodromal phases of neurodegenerative conditions, RBD consistently shows sensitivity for predicting them. Although this may seem nightmarish for patients at the moment, as disease modifying therapies are developed, early detection of RBD and synucleinopathies may be the stuff of dreams. 1. Portet F,Touchon J. REM Sleep behavioral disorder. Revue neurologique. 2002;158(11):1049-1056. 2. St. Louis EK, Boeve BF. REM sleep behavior disorder: diagnosis, clinical implications, and future directions. Mayo Clinic Proc. 2019; 92(11):1723-1736. 3. Boot BP. Comprehensive treatment of dementia with Lewy bodies. Alzheimers Res Ther. 2015 May 29;7(1):45. 4. 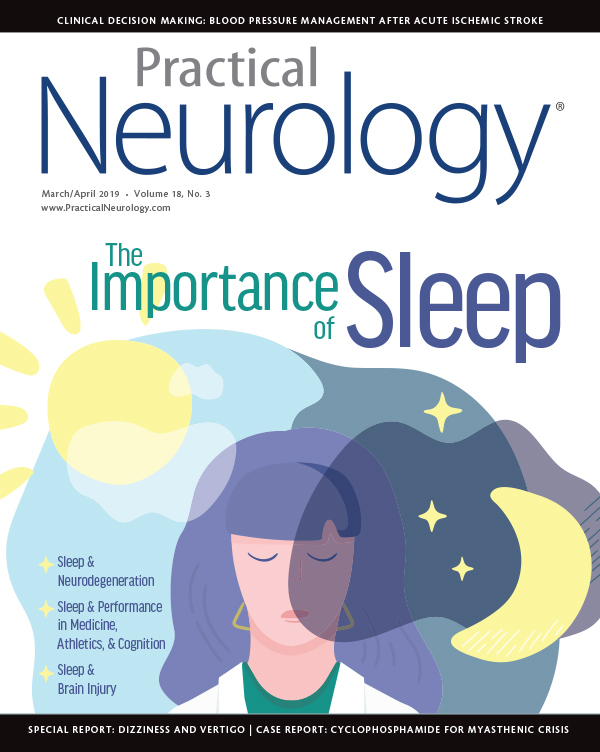 Arnaldi D, Antelmi E, St Louis EK, Postuma RB, Arnulf I. Idiopathic REM sleep behavior disorder and neurodegenerative risk: to tell or not to tell to the patient? How to minimize the risk? Sleep Med Rev. 2017;36:82-95. 5. Postuma RB, Iranzo A, Hu M, et al. Risk and predictors of dementia and parkinsonism in idiopathic REM sleep behaviour disorder: a multicentre study. Brain. 2019;142(3):744-759. 6. St Louis EK, Boeve AR, Boeve BF. REM sleep behavior disorder in Parkinson’s disease and other synucleinopathies. Movement Dis. 2017;32:645-658. 7. American Academy of Sleep Medicine. Michel Jouvet: Sleep Research Pioneer (1925-2017). https://aasm.org/michel-jouvet-sleep-research-pioneer-1925-2017/. Published October 4, 2017. Accessed March 6, 2019. 8. Schenck CH, Bundlie SR, Ettinger MG, Mahowald MW. Chronic behavioral disorders of human REM sleep: a new category of parasomnia. Sleep. 1986;9(2):293-308. 9. Fraigne JJ, Torontali ZA, Snow MB, Peever JH. REM sleep at its core - circuits, neurotransmitters, and pathophysiology. Front Neurol. 2015;(6):123. 10. Boeve BF, Silber MH, Ferman TJ, et al. Clinicopathologic correlations in 172 cases of rapid eye movement sleep behavior disorder with or without a coexisting neurologic disorder. Sleep Med. 2013;14(8):754-762. 11. Kunze A, Lancee J, Morina N, Kindt M, Arntz A. Efficacy and mechanisms of imagery rescripting and imaginal exposure for nightmares: study protocol for a randomized controlled trial. Trials. 2016;17:469. 12. McCarter SJ, Boswell CL, St Louis EK, et al. Treatment outcomes in REM sleep behavior disorder. Sleep Med. 2013;14(3):237-242. 13. McKeith IG, et al. Diagnosis and management of dementia with Lewy bodies: fourth consensus report of the DLB Consortium. Neurology. 2017;89(1):88-100. 14. Aurora RN, Zak RS, Maganti RK, et al. Best practice guide for the treatment for REM sleep behavior disorder (RBD). J Clin Sleep Med. 2010;6(1):85-95.